Burglary victims have been reunited with their stolen property thanks to a police operation involving five forces. Between February 10 and 11 there were nine burglaries in Felmersham and one break-in at Pavenham. Among the items snatched by thieves were four road bikes worth a total of £7,000 and power tools worth around £5,000. Later that month, a raid in Peterborough by fellow police forces recovered a vast amount of stolen property, which pricked the ears of Bedfordshire-based PCSO Paul Jones. 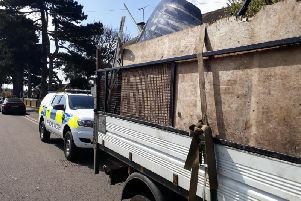 The officer asked the forces for a list and pictures of the recovered items to check against the Beds crime system and found that much of it matched the descriptions of items taken during the village break-ins. The goods have now been returned to their rightful owners. PSCO Jones said: “The Bedfordshire victims were obviously very pleased to have their items returned, and one from a Felmersham burglary explained how valuable his recovered bikes were – both sentimentally and financially. He said he never expected to see them again. “Another of the tools we recovered and returned to the victim was a piece of specialised surveying equipment costing £3,000 alone. The operation included Bedfordshire, Nottinghamshire, Cambridgeshire, Essex and Northamptonshire police forces. Beds Police is continuing to make enquiries to bring the offenders to justice, with a regional investigation still ongoing and suspects currently on bail. Anyone with information is asked to call police via the non-emergency number 101, text 07786 200 011, or call Crimestoppers anonymously on 0800 555 111.